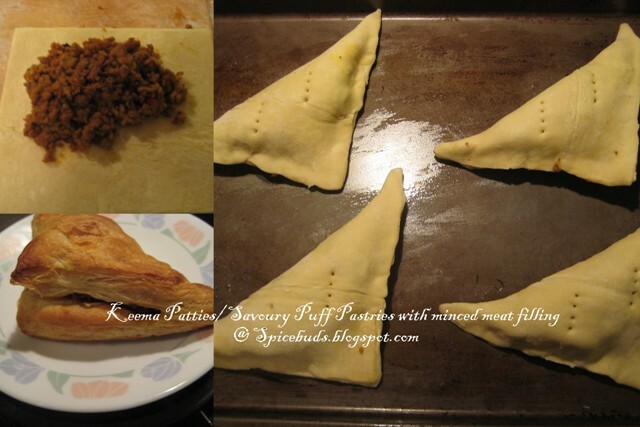 As I promised in my last post, here's one very easy recipe using keema(minced meat)....Keema Patties as we use to call it in India or I should say Savoury Puff Pastries with minced meat filling. It can be served as snack or as we like to have it as holiday brunch item also. Usually I cook keema a day before for this & then it's his responsibility to get these patties/puff pastries into final shape & to the table. You can use any left over keema or make fresh batch, only thing important here is, it should be totally dry & at room temperature. In case of any water in the cooked keema cook it on the high flame without any cover & keep stirring it till all the water evaporates & keema is pretty dry. Let it cool completely before using in the recipe. Following recipe will yield 4 patties. Note : Fish out the bay leaves & whole red chillies from the filling. Open up the pastry sheet. Cut the puff pastry sheet into 4 equal squares. Divide keema filling into 4 equal parts. Put each portion of filling into the centre of each square. Wet one of your finger and run it over the inside edge of pastry sheet square. Fold it into triangles & press gently onto the sides to seal the edges. Repeat with all the squares. Put it on a lightly greased baking sheet. Using a fork pierce the triangles at 3-4 places. Bake as per the package directions or at 400 degree F till the patties turn lightly golden brown. Serve with your choice of sauce/ ketchup/ chutney and please be careful, meat inside will be really hot & did I told U they are addictive and I really mean it. That looks so yummy.Can have puffs anytime! How are you? I am here after a long time..Very nice bake,,( your keema recipe is too good ). These pastry puffs are one of the best things invented :-) LOVE it. A loves this with aloo inside, like they sell in India - veggie puffs. So delectable. Sorry dear I think i have wrongly typed puff pastry in keema matar..
everytime i see savory puffs baked at home my hands itch too...awesome work. love this and the flower cake. Love the crust on these puffs! They definitely look perfect! Oh, you are a life saver. I love these puffs, filled with potato, chicken, mince meat. I am going to try making this soon.